In overturning a 30 year wait for victory at this grade, Moycarkey-Borris emphatically brushed that statistic aside by dominating proceedings against a powerless Holycross-Ballycahill side in The Ragg on Saturday afternoon last, September 19th, to claim the cup last lifted by the club all those years ago. Driven on by the terrific backline and midfield units which supplied all the cards to the forward pack where the scoring aces lay in spades, this was to be Moycarkey’s day. Philip Ryan was superb at right half back and his dashing forays out of defence right from the throw in laid down a marker of the Moycarkey Borris intent. So much so it was Ryan who in full flight opened his sides account in the opening minute before Holycross even had a chance to settle. With the equally impressive pair of Jack’s, Fallon and Morrissey in front of Ryan’s half backline the Holycross rear-guard was under a relentless siege of red and yellow over the hour. Darren Flood and Max Hackett, two of the aforementioned aces followed up with a point each as Moycarkey kept surging forward early on. However, all the good work was brought to a temporary halt as Mikey Nally’s long ball into the Moycarkey goalmouth found its way to the net to level the tie on five minutes and awaken the Holycross cause. Eddie O’Gorman was proving to be a handful at full forward for Holycross and after he took a great catch his quick release found Colin Nolan in space who fired over from close range to put his side one ahead on eight minutes. A lull came to the scoring then as both sides took the measure of each other before Anthony McKelvey hit over a free to restore parity on the quarter hour mark. Almost immediately Flood had the Holycross net rattled as the ‘Borris lads again gained control. Hackett then hit over from a tight angle to put his side four up. Beavering away Darragh Woods opened his account in the nineteenth minute from a ’65 as his supply was being kept to a minimum by the influence of Fallon at his side. Moycarkey then hit another three minute purple patch to put clear daylight between the sides. The highly imposing Caolan O’Brien deservedly got on the scoresheet following great work from Philip Ryan further out the field. Then a sublime move saw Fallon show a clean pair of heels as he broke through the heart of the Holycross defence feeding Flood to his right. With equal momentum Flood fed McKelvey who bearing down on goal took full advantage of the advancing keeper in hitting the net to jubilant Moycarkey Borris cheers. If that was good the next score was something special. Fallon with the score of the match, a superb point over his shoulder from the middle of the field oozed with class from a player at the top of his game. That stinging score ignited the Holycross spark again and once more it was Nally leading the charge. This time his ball from defence found Woods who pointed from out on the right. Keeping up the pressure Woods from a brilliant side-line cut also from the right saw his ball make its way to the net bringing his side right back into the match. How on earth he split the posts with another side-line ball further up the line from almost on the fourteen metre mark is anyone’s guess, but Woods showed how clinical he can be given half a chance at all. Not playing well Holycross were back in the game with only a goal between the sides as half time approached. McKelvey though had other ideas and he too when given a sniff can manufacture a score and that is what he did ahead of the half time whistle. A superb break through from the right say him find the bottom corner of the net to put Moycarkey in command 3-7 to 2-4 at the break. Following opening points from both sides Cormac O’Connor on the Holycross goal line had to be at his sharpest when stopping a shot at the net from Fallon as Moycarkey sought to turn the screw. Nothing he could do about it nine minutes into the half when McKelvey went low to catch superbly and with great vision he deftly released inside to Hackett who drifted into space at pace shooting to the net on the run, Moycarkey well on their way. Woods put over his second placed ball of the half before a succession of Moycarkey points saw them move further out of sight. With ten minutes to play Flood scored his second goal following great interplay between Morrissey and Jack Hackett. Woods tagged on three points for his side only to see them matched almost score for score as Moycarkey-Borris sealed an historic and deserved victory. 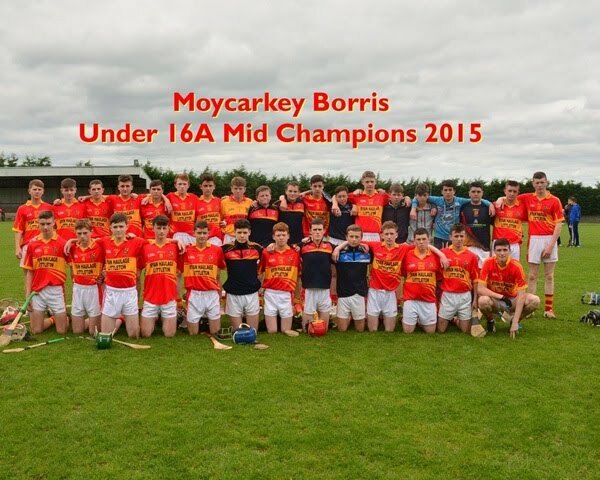 So a great result for Moycarkey whose sharpness across the field underlined the unity of their play. Along with those already mentioned Kevin Hayes and Michael Murphy enhanced their profiles at the back while Shane Maher contributed handsomely to the movement of their attacking play on an overall superb team performance. It was an uncharacteristic off day for the Holycross lads who never got going to their full potential. Darragh Woods was the main attacking threat and tried extremely hard throughout as did Eddie O’Gorman, Mikey Nally and Colin Nolan. With his influence curtailed by a virus, Bryan O’Meara tried his best to get going but the energy just wasn’t there. With flashes of brilliance from Jimmy Ryan also the Holycross engine needed more to get them going if they needed to close the gap but things simply didn’t click. 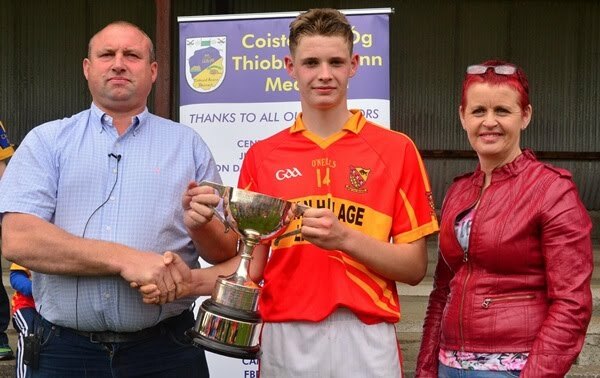 Following customary pats on the back, Mid Coiste na nÓg Chairman, presented the cup to winning Moycarkey Borris captain Anthony McKelvey with Eamon Darmody sponsor also on hand. Before the match a minutes silence was held as a mark of respect to the late Eddie Connolly Loughmore Castleiney, Ar dheis De go raibh a anam. 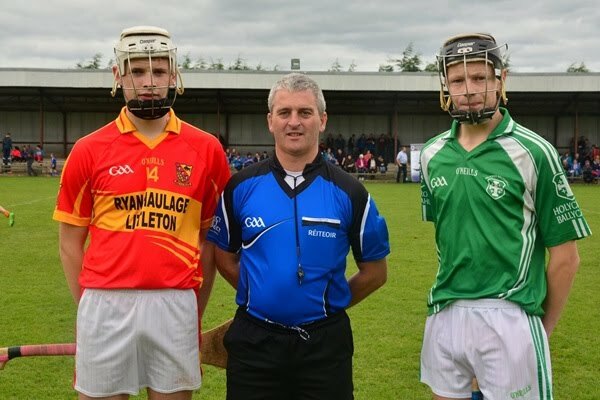 Moycarkey-Borris: Rhys Shelly, Kieran Kearney, Rory Darmody, Kevin Hayes, Philip Ryan 0-1, Zach Jackson, Michael Murphy, Jack Fallon 0-2 (0-1f), Jack Morrissey 0-1, Shane Maher, Darren Flood 2-3, John Kirwan, Max Hackett 1-3, Anthony McKelvey 2-3 (0-3f), Caolan O’Brien 0-2.